Hydro-Gear T2 Hydrostatic Transaxle: supplies infinitely variable speed up to 4.2 mph forward/1.7 mph reverse. Noram Mechanical Blade Clutch: provides for “clutch-less” forward, instant reverse drive propulsion and ensures constant blade engagement with a blade brake mechanism that stops the blade nearly instantaneously when disengaged for user safety. Solid Linkage Controls: 3/8” solid rods (not wearable cables) connect operator controls to the transmission, mower deck, and park brake. Speed Control Dialer: Setting a maximum speed ensures a firm grip on control handles for concise control and eliminates the risk of accidental speed fluctuation by the operator. Traction Tires: Large, dual 16” flat resistant foam filled urethane tires tackle tough terrain and come standard. Cutter Deck: 30” wide, 10-gauge welded steel deck provides a rugged and deep chamber to cut and chop brush. 26” reversible blade cuts brush up to two inches thick. 2.5” wide plate steel skid shoes are adjustable and provide excellent floatation over rough terrain. Little Wonder warranties the Hydro Brush Cutter for 2-Years (Commercial/Rental) against defect, engine warranted separately by manufacturer. 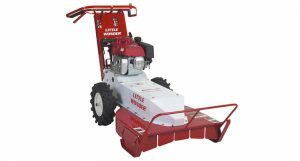 To learn more about the full line of Little Wonder landscaping and debris management equipment, visit www.littlewonder.com or call toll-free 1-877-596-6337. Get Proven Results. Get Little Wonder.